The Church is one of the most stunning bars in Dublin. Still boasting the organ and spectacular stained glass window - eat, drink and dance the night away. 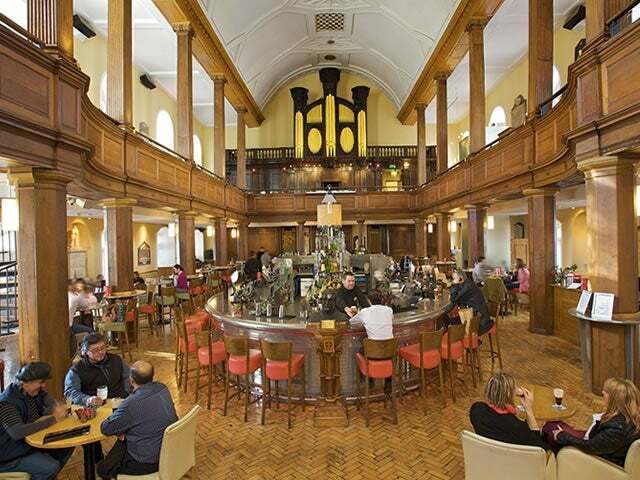 The Church is one of the most stunning bars in Ireland. As the name suggests, it was once a sacred space, formerly St. Mary’s Church and one of the earliest examples of a galleried church in Dublin. Built at the beginning of the 18th century, it still boasts an organ and spectacular stained glass window. The church closed its doors in the 1960s and lay derelict for a number of years. Now it has been remade as a popular and attractive drinking, dining and dancing spot, a gorgeous room in which to carouse, the light streaming in through those stained glass windows. The main bar serves up colourful cocktails, potent martinis – the house Martini is a mix of Absolut Vanilla Vodka shaken with passion fruit, pineapple juice and vanilla infused sugar syrup topped with Prosecco – and a huge selection of whiskeys (they offer whiskey tasting sessions too). There’s a decent restaurant menu and room for dancing if the spirit so moves you. There’s also a beer garden for al fresco drinking when the weather is suitably friendly. But it’s the dramatic building itself that’s the real draw here.